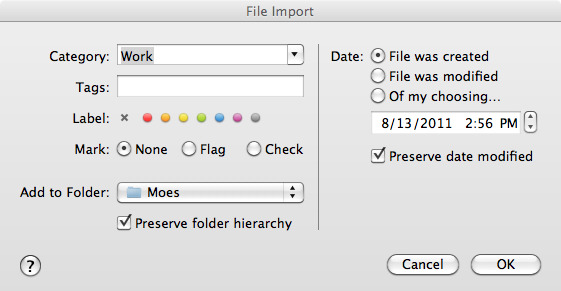 I’ve been struggling with what to do with my Moe’s notes on my desktop for over a year. I was thinking of investing in Pear Note but didn’t because it doesn’t offer a mobile counterpart and was limited in other crucial (for me) areas. I’ve tried everything else. Simultaneously, I’ve been struggling to replace Journler as my Go-To note taker. I love Curio for creative brainstorming, like DevonThink for permanent/archived things and I like Notational Velocity for quick notes and syncing with SimpleNote on my iPhone, but nothing replaces the ease and reliability of Journler. I happened to look at the website to see if there was any news (despite being great software and Phil offering good support (to me at least) and an active forum, it’s been abandonware for some time). But low and behold there was a beta of a new version for Snow Leopard and Lion. I downloaded it, thinking I had already dismantled my database but to my great joy it fired right up well over a year later. Needless to say, it brought back memories. I flashed to my Moe’s problem, and 2 minutes later I had the answer to my problems. All of the Moe’s folders imported as folders, in their place and each folder had the same files as in the original folders. Images were intact in one file. Audio — playable from within Journler — in another. And notes in a third and metadata in a fourth. In Journler: File -> Import Files. Select your Moe’s backup folder. You’ll see the box above – select your category, tags, label and how to deal with the dates. Make sure ‘Preserve folder hierarchy’ is checked below your selected folder. Sit back and wait (folders with lots of data might take a couple of minutes). You’re done!